Wanzl shelving creates inspiring spaces using versatile layout options and a wide range of materials, surfaces and colours. The high-quality, rigid Wanzl systems combine aesthetics with functionality and economy, offering plenty of options for individualised presentation. 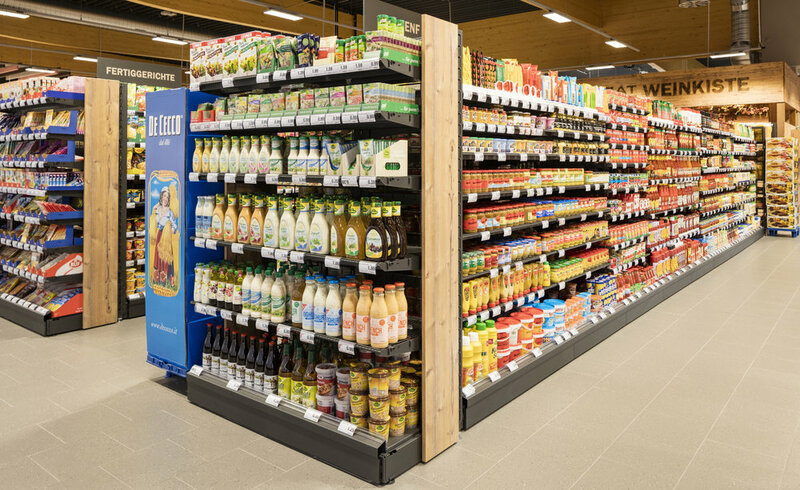 In addition, we have the System 4000 range of shelving and mobile racking systems, perfect for store re-fit projects. This range of shelving has an almost limitless range of shapes: convex, concave, straight and curved. Click here to see a detailed brochure on Wiretech shelving. With its focus on ensuring maximum economy of space for products, there are many sizes and configurations to suit your requirements. Click here to see detailed brochure on Wiretech 100 Shelving system. Designed to be multifunctional, this elegant, slimline wire shelving system offers countless system modules such as wall racks and gondolas all with adjustable fittings. It’s sister system, Vinotech shelves and panels are compatible with Puretech. Click here to see detailed brochure on Puretech shelving or learn more. Sitting alongside the Wanzl ranges we have our own System 4000 shelving solution. A Highly configurable and economical option for a range of retail solutions. To enable you to keep selling while doing a retail fit out project, we have a range of mobile shelving options available for hire.